Over the past 20 years, Rhythm Fusion has been blessed by unimaginable growth, inspiration, and joy in the Santa Cruz Community and beyond. It has been a great and unforgettable ride. “shape shift” because we are closing but not disappearing!! (We’re looking for warehouse/storage space,( or our garage) and keep going with our online sales & Special orders. We will also continue our drum repair service. We will continue to promote workshops and I will still be teaching and doing live performances and concerts. 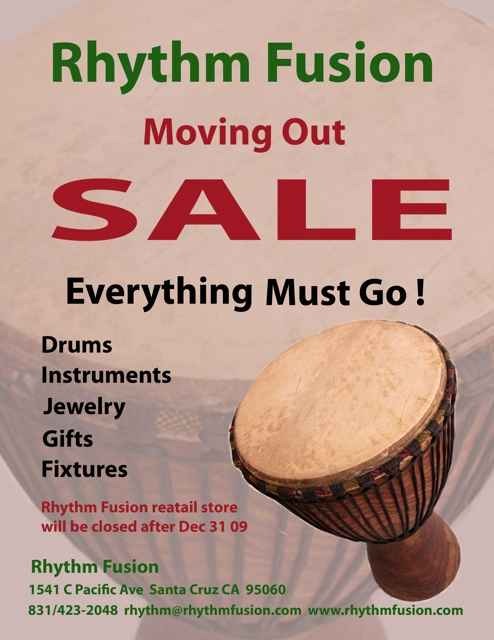 Rhythm Fusion’s Retail Shop will be closing the doors after December 31, 2009. Until then, ALL is on SALE! Please sign our email list so that we can keep in touch. We plan on having the same telephone number and email address in the future. We’ll do our very best to keep life alive and hope we can do it together with you! Thank you for all your business, help, support, love and encouragement throughout the years. We are going to miss you! Stay in touch! Posted 9 years, 4 months ago at 4:17 pm.